The non-indictment indictment. When FBI Director James B. Comey announced on July 5 that Hillary would not be recommended for indictment as a result of her use of private email servers while Secretary of State, a major burden was lifted off the shoulders of the Clinton campaign. This led to a collective sigh of relief among Democrats and anger and disappointment by Republicans. In a public, straightforward speech, Comey excoriated Clinton for multiple misdeeds but mostly determined the former Secretary of State was “extremely careless” in her handling of classified information contained in emails. The main reason the FBI did not recommend punishment was that there was no evidence to indicate “intent” to misuse the email system or that she was grossly negligent. This does not mean there wasn’t intent; it means there was insufficient evidence to support it. By the thinnest of margins, Hillary escaped the legal morass that would have all but killed her chances of being elected though this “scandal” will be kept alive by her opponent and the GOP throughout the remainder of the campaign. Moreover, a poll showed that 56 percent opposed her exoneration, and that’s not good. Nonetheless, the threat of indictment has vanished and is clear to run. He’s with her. 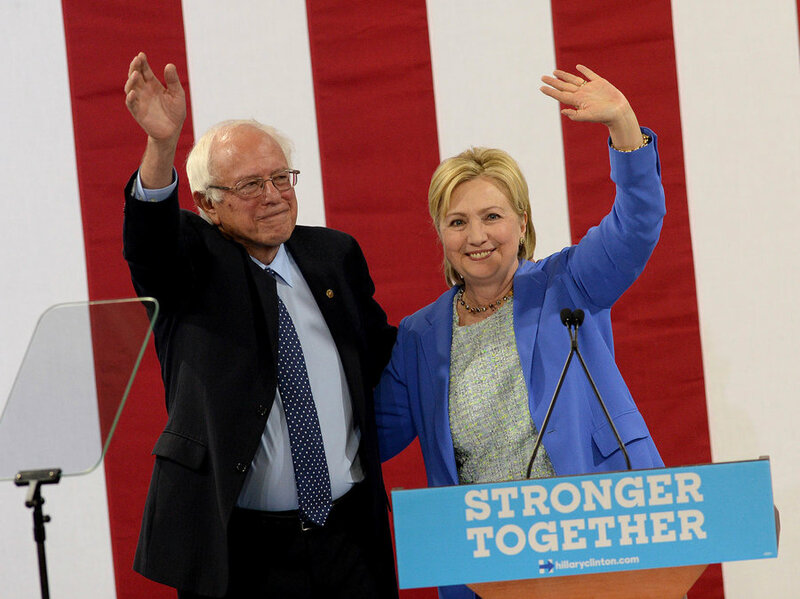 Bernie Sanders effectively ended his underdog campaign on July 12 when he, for the first time, publicly endorsed Hillary for President. The Clinton camp had to concede several left-leaning issues contained in the Democratic Platform to basically win the peace. Had she not, Sanders and his followers would have likely made some form of trouble at the upcoming Democratic National Convention with floor fights, demonstrations and other tools to rain on Hillary’s parade. That was never explicitly stated but the implied threat was there and Hillary complied with the majority of Sanders’ demands. Then there was the worry that Sanders would launch a third party campaign (after all, he's not a true Democrat), which would doom Hillary's chances for sure. With their joint rally in Portsmouth, NH where the endorsement took place, those circumstances have been obviated. The hope is that Bernie’s supporters would now work for or at least vote for Clinton in the fall. It’s not clear that will happen among some Sanders hold-outs. But with Bernie on board, Hillary will not feel compelled to choose a running mate to the left of her, such as Sen. Sherrod Brown or Sen. Elizabeth Warren, to appease the enthusiastic Sanders backers. She could now select a running mate based on other factors that are more comfortable to her. For his part, Trump is doing everything possible to help Hillary. Every day, it seems, he opens his mouth and bad things come out of it. He reinforces the narrative Hillary has embarked on that he does not have the temperament, experience or skill set to be Commander-in-Chief. 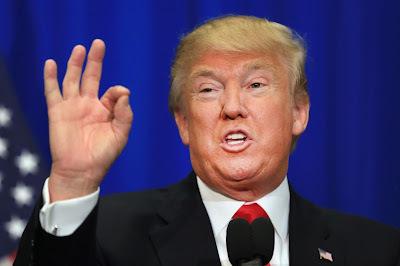 Trump’s bullying antics on Twitter and at rallies, the juvenile name-calling, the oversimplification of complex issues, his gross narcissism, and bigoted pronouncements render him a scary choice. It’s hard to say if any other GOP candidate would have defeated Hillary because many of them had their own flaws. Even with a fractured Republican Party heading into the convention and what seems to be a relatively unified Democratic party bolstered by the support of President Obama and other Dem leaders as well as Sanders, the race seems too close for comfort at this point. There is much more ahead with the conventions, the VP picks, the debates, the long campaign, and unexpected events that are sure to transpire between now and November that will determine the final outcome. Regardless, Hillary Clinton should definitely thank these lucky stars for at least being in the game. Mr. Minnick, who is also the show’s accomplished choreographer, is blessed to work with an incredible cast who clearly enjoy themselves on Toby’s in-the-round stage as much as the audience does. The technical crew, creative team, and the musical direction of Ross Scott Rawlings enhance the performances even more. 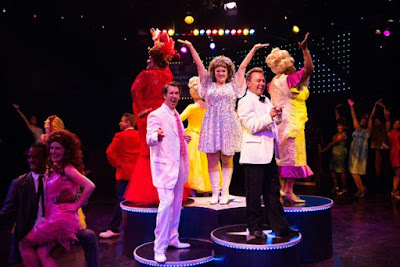 Hairspray with a score by Marc Shaiman, lyrics by Scott Wittman and Shaiman and a book by Mark O'Donnell and Thomas Meehan, based on the 1988 John Waters film Hairspray, copped eight Tony Awards in 2003. The songs from the opening iconic number “Good Morning Baltimore” to the final “You Can’t Stop the Beat” are eclectic. From 60’s-style dance music to rhythm and blues—upbeat high-tempo to soft emotional ballads—the music and lyrics are outstanding. 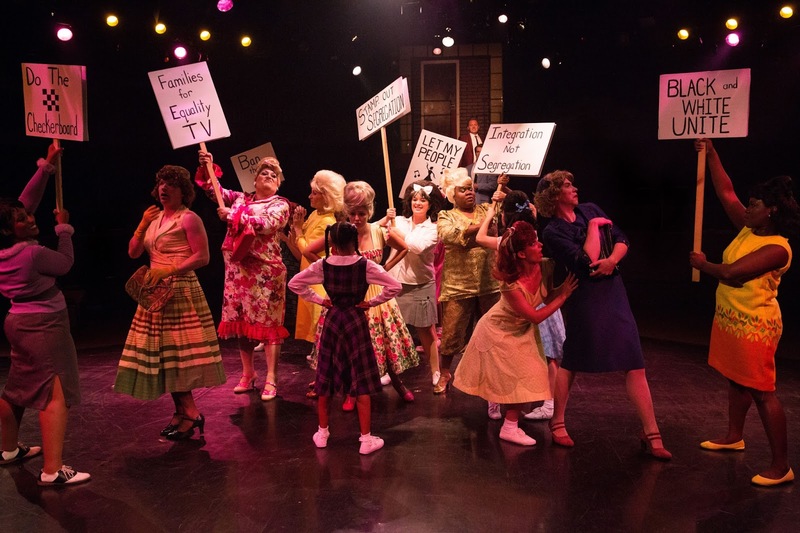 Nineteen sixty-two Baltimore is the backdrop for the story that centers on the main underdog, plucky Tracy Turnblad played marvelously by Christie Graham. 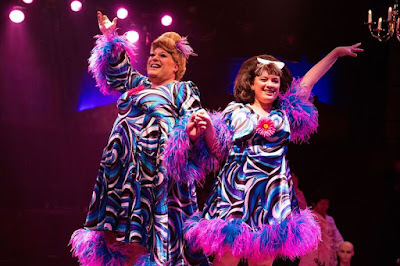 In most versions of Hairspray, Tracy is “pleasantly plump.” In this production, Ms. Graham is not as rotund as other Tracy Turnblads but her level of talent overcomes that slight inconsistency and is never a detriment. Her mother, however, Edna, a drag role played with panache by the ultra-talented Lawrence B. Munsey, is a plus size for sure. 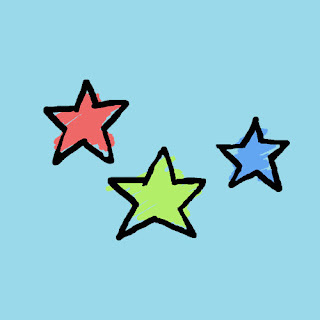 Against the odds, our heroine Tracy seeks to be a dancer on the local Corny Collins TV show and winds up being a star, successfully covets the heartthrob Link Larkin in an unlikely match, and rallies against racial segregation. There are many clever references to the Baltimore area and culture in 1962. On the night this production was reviewed there were an unusual number of young people in the audience. Quips about the Gabor Sisters, Eddie Fisher and others from that era may have blown over their heads like misaimed squirts from a container of hairspray. But for the adults who remember that time, they hit the mark. Toby’s resident performers Jeffrey Shankle as Corny Collins, Lawrence B. Munsey as homebody Edna Turnblad, David James as Tracy’s encouraging father and Edna’s adoring husband Wilmer Turnblad, and Heather Marie Beck as one of the villains, Velma Von Tussle all reprise their roles from the production of Hairspray at Toby’s Columbia six years ago. With much experience under their belts since then, it is no surprise they handle their roles with stunning proficiency and flair. Mr. Munsey, in particular, turns in a tour-de-force performance. Mr. Shankle is perfectly cast for his role. Darren McDonnell, playing several “authority figure” roles, also shines with the appropriate dose of campiness. Sophie Schulman who plays a rather dim Penny Pingleton, Tracy’s closest friend, is excellent and serves up many of the comedic lines. Penny falls in love with African-American Seaweed J. Stubbs played by Andre Hinds who has a big part in the integration effort. Mr. Hinds, using his lithe physique, is an exceptional dancer with grace and power. He sparkles with is jaw-dropping flips and spins during several of the dance numbers. And he can act quite well displaying ample passion without going over the top. Overall, the choreography directed by Mr. Minnick is exceptional, high-energy and precise. The members of the talented ensemble execute the dance sequences superbly. As an example, the number “The Big Dollhouse” that opens up the Second Act is sensational in its choreography. The Turnblad couple played by Mr. Munsey and Mr. James reminisce in “You’re Timeless to Me” and is one of the show’s many highlights. The ballad is an adorable love song oozing with emotion and camp that will make you smile. These two outstanding performers nailed it. Another highlight and probably worth the price of admission besides the scrumptious buffet is the performance by Kelli Blackwell as Motormouth Maybelle, the mother of Seaweed and Little Inez (played by cute Nowelle Robinson). Her powerful rendition of “I Know Where I’ve Been” whereby she recalls the fight for equality is almost guaranteed to make your eyes well up in tears. Other talented members of the company who make this production work so well include Sean McComas, Rachel Kemp, AJ Whittenberger, Erica Clare, Joey Ellinghaus, Amanda Kaplan, Coby Kay Callahan, Solomon Parker III, and Gerald Jordon. Mr. Munsey along with Mary Quinn designed the glorious costumes that are right on target especially that red satiny gown Mr. Munsey wears at show’s end. With tongue and cheek, he said, “I made it myself.” Oh, and those bountiful, big-hair wigs! Love ‘em. The set designed by David A. Hopkins that featured photos of Baltimore houses along the theater’s walls aided by Lynn Joslin’s lighting design and a multitude of props provide effective scene changes and texture. I would like to see a prototype of a TV camera used during the Corny Collins Show sequences similar to the one employed at Toby’s production of Memphis in 2014 to give it a TV studio identity. 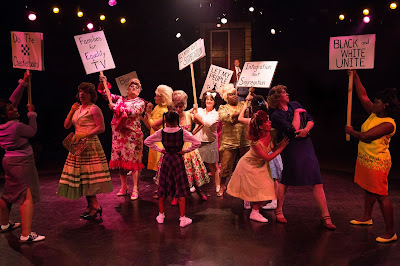 This production of Hairspray succeeds on all fronts that entertains and delivers a powerful message. 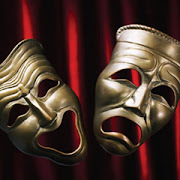 Mr. Minnick directs these extraordinary performers with great skill and is a sure-fire crowd pleaser. This is a must-see show without question. You can’t stop the beat, and why would you want to? Running time. Approximately two hours and 30 minutes with an intermission. Hairspray at Toby’s The Dinner Theatre of Columbia runs through September 4. For tickets and information, call 410-730-8311 or visit tobysdinnertheatre.com or ticketmaster.com.